Give your outfit a lift! A perfect party shoe, this stylish heel is stable and supportive. With super-soft linings, a seam-free toe and underfoot cushioning, it’s also exceptionally comfy. Fashion meets function in this ultimate, comfort court shoe. The heel is stable and supportive and it has a soft, cushioned footbed so you can celebrate in comfort as well as style. There’s more to this dressy shoe than meets the eye! The decorative button disguises a touch-fastening strap that peels back to expose a stretchy gusset. This is a flattering, feminine shoe. The beautiful fabrics combined with a smooth, grained leather-look strap and button detail bring a touch of glamour to any outfit. Take a walk on the wild side with Koryl in leopard print! 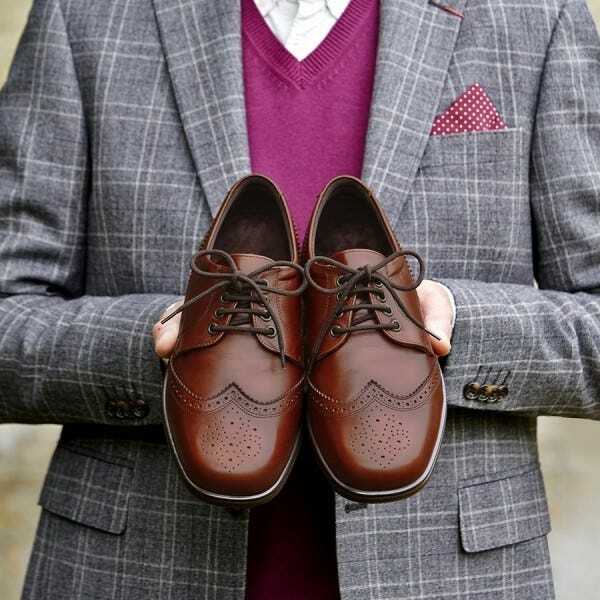 Our extra roomy brogue is the perfect partner for formal wear. Crafted from soft, hand-finished leathers and with a cushioned footbed, this handsome shoe feels as good as it looks. I have hammer toes and wear insoles in my shoes I normally take a size 6 with EEE fittings, can you help? We can advise that our fittings go up to a 5E+ width, which is slightly more than the triple E size you have stated. However, a lot of our styles are adjustable so there is a good chance that our footwear will be suitable for you. Also, with our unlimited, no quibble returns policy which is free to use through the Post Office you would be welcome to buy things, try them and return them if they are unsuitable. Should you require any more information, please do not hesitate to contact us on 01458 447275 to discuss options with our customer service advisors.